Manny Pangilinan and his foreign backers and financiers, who have interests in LRT, MRT and Maynilad, must be grinning widely right now. With the public still reeling from the huge LRT/MRT fare hike, Maynilad Water Services Inc. announced that it will soon implement a significant increase in its basic charge. The average increase is P3.06 per cubic meter. What makes this rate hike as awfully unjust as the LRT/MRT fare hike is that 65% of the increase (about P1.99 per cu. 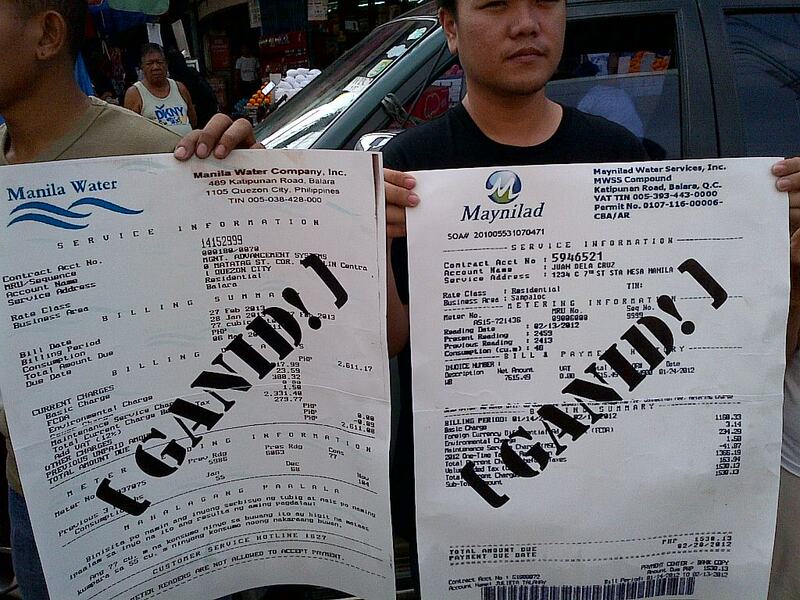 m) will be used to recover the income tax of Maynilad. This was disclosed by the water firm’s Chief Finance Officer as quoted in a news report. This means that hapless consumers will continue to pay for the corporate income tax of a highly profitable big business that has been cashing in on a basic service. 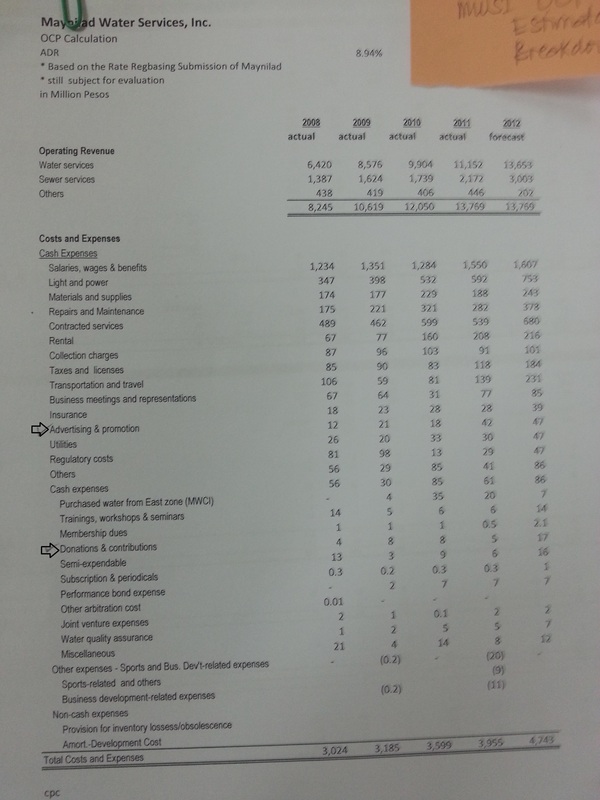 In 2013, Maynilad reported a core income of P7.53 billion. 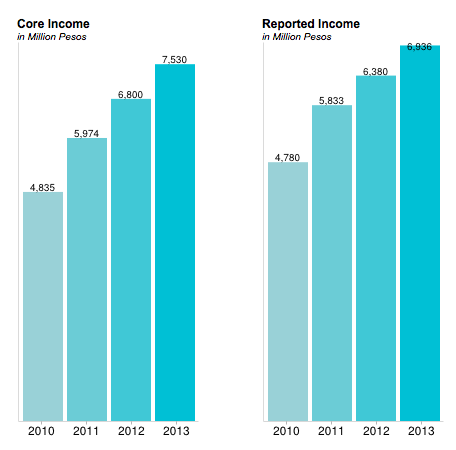 (See chart below) Since 2010, its core income has been growing by more than 16% annually. Maynilad’s rising profits are mainly pushed by ever increasing water rates due to periodic and automatic adjustments allowed in its Concession Agreement with the Metropolitan Waterworks and Sewerage System (MWSS). Since taking over in 1997, Maynilad’s water rates have already ballooned by more than 500 percent. Since 2010, its all-in tariff (basic charge plus other charges) has jumped by more than 40 percent, which could further go up when the higher basic charge is implemented. To recall, the MWSS-Regulatory Office (RO) disallowed Maynilad and Manila Water Co. from including income tax recovery in their computation of the basic charge. Maynilad and Manila Water separately challenged the decision through arbitration led by the International Chamber of Commerce (ICC), a dispute resolution mechanism established by the Concession Agreement. Manila Water is still awaiting the result of its own arbitration case as of this posting. 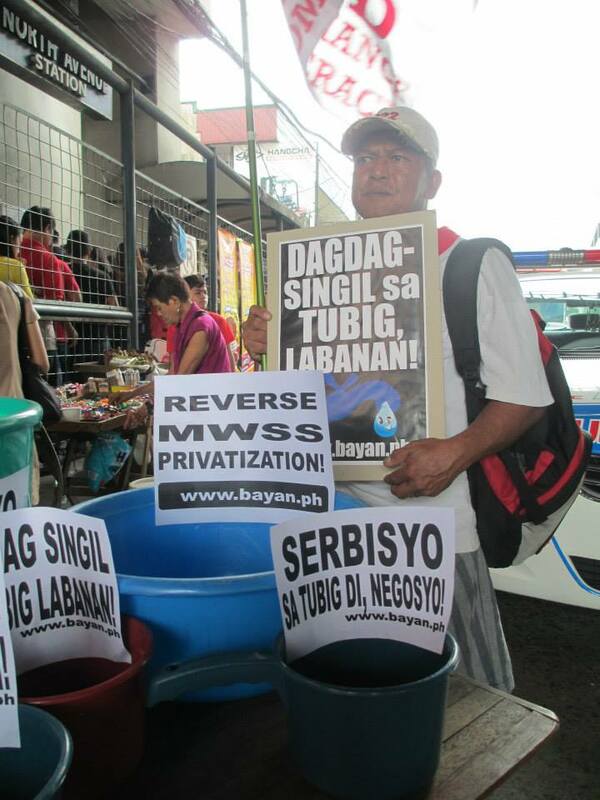 The income tax is actually just one of the various issues raised by the MWSS-RO against Maynilad and Manila Water. Another is the P1 per cu. m. currency exchange rate adjustment (CERA), which the regulators ordered Maynilad to discontinue charging to its customers since a similar recovery mechanism – the foreign currency differential adjustment (FCDA), which recently also pushed water rates up – is already being imposed by Maynilad. But apparently, because of the arbitration, the CERA will remain in Maynilad’s water bill, and is now tucked in the basic charge. The World Water Day quietly passed by last March 22. It’s a United Nations (UN) event that has been observed since 1993 to highlight the issues facing global water resources. For this year, the World Water Day had as its focus the water-energy nexus and how the world’s poorest survive without access to safe drinking water, adequate sanitation, sufficient food and energy services. Alas, it was also an occasion used by the UN to push for the further privatization and commodification of water and energy resources. In the Philippines, the UN’s renewed support for the corporate takeover of water and energy sectors came at a time when these policies are seriously being challenged as consumers grasp a better understanding of how oligarchic firms are squeezing them dry with impunity under privatization. 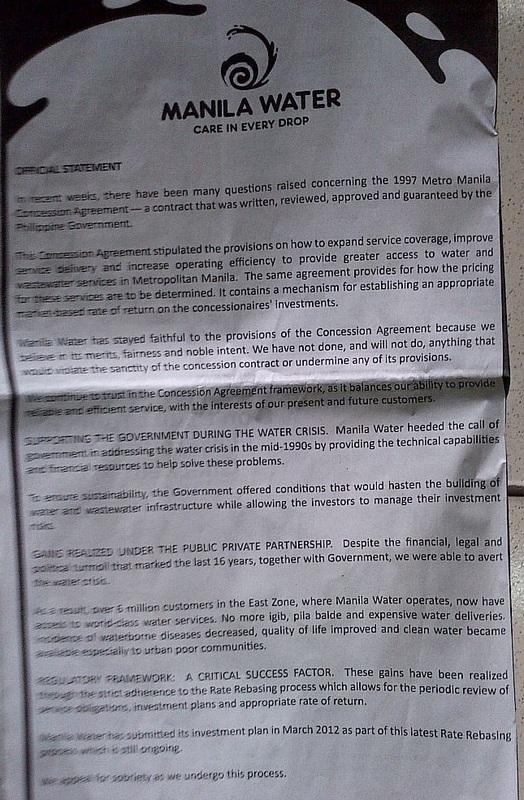 The controversial pass-on charges that private water operators Manila Water Company and Maynilad Water Services Inc. that include their corporate income tax, among others, have forced the Metropolitan Waterworks and Sewerage System (MWSS) Regulatory Office (RO) to reject the bid for higher water rates of the said companies. Meanwhile, the obvious price rigging at the power spot market compelled the Energy Regulatory Commission (ERC) to order the recalculation of the electricity rate hike that the Manila Electric Co. (Meralco) is seeking. In both cases, it was the vigilant public – through people’s organizations, consumer groups and progressive political parties – that challenged the onerous rate increases. Thus, for proponents of privatization who are grappling with legitimacy issues, the UN report could not have come at a better time. Such coordinated policies, according to the UN, include revising pricing practices to ensure that water and energy are sold at rates that reflect their real cost and environmental impact more accurately. Furthermore, noting that the scope of investments required to developing durable alternative infrastructures, the UN underscored that the private sector should play a major role in supplementing public expenditure. 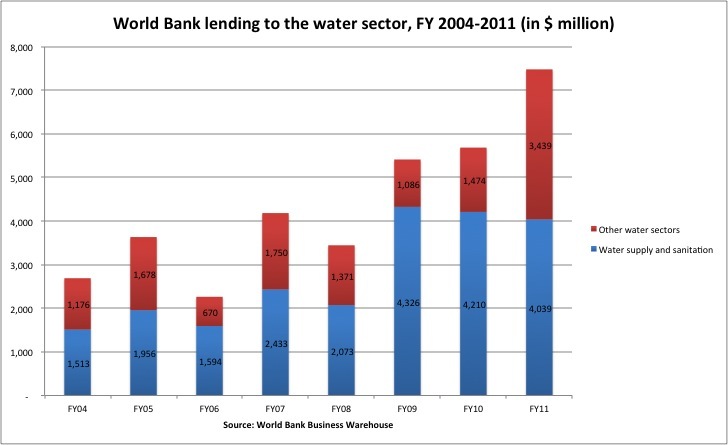 International financial institutions (IFIs) notably the World Bank and the Asian Development Bank (ADB) are long propagating this idea of private participation in infrastructure, or also called Public-Private Partnership (PPP), and the associated principle of full cost recovery. They in fact played a central role in bankrolling neoliberal structural reforms in the water and energy sectors in many countries, mostly in the poor, debt-ridden Third World. Reflecting the real cost of water and energy is of course a euphemism for more expensive water and electricity bills which often result from privatization and deregulation. Proponents of these neoliberal policies peddle the distorted notion that when the true economic cost of water and power is reflected through full cost recovery, its wasteful use will be addressed or even reversed, and would promote the efficient and equitable use of resources. The Dublin Principle – a product of the 1992 International Conference on Water and Environment held in Dublin, Ireland – for instance, voiced the neoliberal assertion that “water has an economic value in all its competing uses and should be recognized as an economic good” and that “managing water as an economic good is an important way of achieving efficient and equitable, and of encouraging conservation”. Full-cost recovery means that user fees paid for by consumers reflect the entire cost of investment and the guaranteed profits of private operators including differentials in factors that could affect profits such as foreign exchange, fuel prices, inflation, and in some cases even so-called regulatory risks, among others. The real intention, however, is to attract and ensure the participation in these sectors of private business, which naturally seeks profit assurances and risks protection. Already, private investors have had substantial participation in developing and operating water and sanitation and energy infrastructures. Data collated by the World Bank’s Private Participation in Infrastructure (PPI) online database show that from 1990 to 2012, 111 countries reported private investments in the energy sector with a total of 2,653 projects reaching financial closure worth about $715.13 billion. Meanwhile, PPI indicators in the water sector during the same period are as follows: 63 countries; 814 projects; and $69.25 billion. Private participation in the energy sector continues to expand both in the number of projects and cost per project. Again using the PPI database of the World Bank, the annual average of PPI investment in the energy sector has grown almost four-fold between the 1990s and the 2010s while the annual number of projects has increased almost three-fold. The average cost per energy project also grew by almost 44% during the same period. 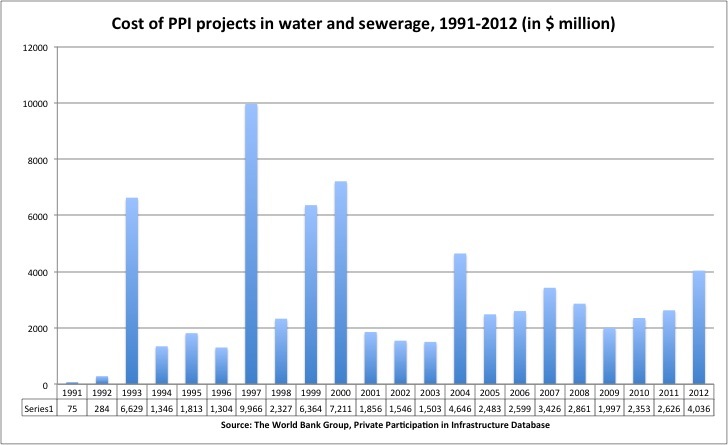 Meanwhile, private participation in the water and sewerage sector has slowed down between the 1990s and 2010s – the annual average of PPI investment dropped by 10%; the annual average number of projects fell by 51%; and the average cost per project declined by more than 40 percent. This may be explained by the fact that several of the biggest urban water utilities were privatized in the 1990s, particularly in the Third World, most notable of which were in Buenos Aires (Argentina) in 1993; Cancun (Mexico) and Gdansk (Poland) in 1994; Kelantan state (Malaysia) and Santa Fe province (Argentina) in 1995; Senegal, Cartagena (Colombia), and Aguascalientes (Mexico) in 1996; and Gabon, Cordoba (Argentina), La Paz–El Alto (Bolivia), Budapest (Hungary), Barranquilla (Colombia), Manila (the Philippines) and Casablanca (Morocco) in 1997. Another reason is the widespread public opposition to water privatization sharpened by the contradiction between water as a human right and public good versus the neoliberal claim of water as an economic commodity that private firms can profit from. In recent years, there is an observable trend towards what some call remunicipalisation or the reversal of water utilities privatization such as in Paris, France; Dar es Salaam, Tanzania; Buenos Aires, Argentina; Hamilton, Canada; and in various municipalities in Malaysia. Neoliberal apologists trumpet privatization as the solution to the lack of access to safe drinking water in the world, especially in poor countries, since state-run water utilities are supposedly too inefficient, bankrupt and oftentimes corrupt to perform its task. One major indicator that privatization champions point to is the Millennium Development Goal (MDG) on water where the world has supposedly achieved the target of halving the proportion of population without access to improved sources of water five years ahead of schedule. But this obscures the reality on the ground that many poor communities are still without access to reliable potable water as “improved sources” in the MDGs could refer not only to individual household connection but also to public taps or standpipes, tube well or boreholes as well as dug wells. Take the case of the privatization of the Metropolitan Waterworks and Sewerage System (MWSS) in Metro Manila, for example. Private concessionaires Manila Water and Maynilad claim almost universal coverage of water supply in their service areas. But parts of their claim are the bulk water connections – mostly in poor communities – where the safety and quality of water and of services are often compromised. Such bulk connections include setting up a single meter for several households, reaching a hundred in some cases. The responsibility of individually connecting to the so-called “mother meter” is up to the community (through its local association or cooperative). In some instances, rubber hoses are used to connect the households to the water supply system. In other cases, a common faucet is built from where the people fetch their water. Clearly, claims of universal coverage and continuous supply of safe drinking water are bloated to give the false impression of improved services. But what is undeniable is how water rates in Metro Manila and adjacent areas have skyrocketed under privatization effectively further marginalizing those who do not have the capacity to pay. Since MWSS was privatized in 1997, the average basic tariff has already ballooned by 585% (Maynilad) to 1,120% (Manila Water). This as the concessionaires passed on to the consumers billions of pesos in questionable charges including their corporate income tax; cost of unimplemented projects; and cost of advertising, promotion and donations on top of passed-on charges due to inflation and foreign currency fluctuations – all while collecting profits at guaranteed rates. The process of arbitration over the rejected water rate hikes between the concessionaires and regulators being conducted by design away from public scrutiny and without consumer participation is a further reason that makes privatization oppressive and unacceptable. 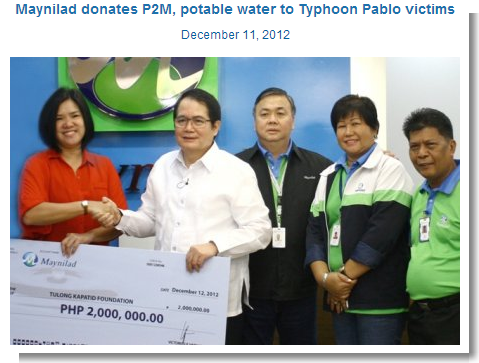 Last year, Maynilad donated P2 million and potable water to victims of typhoon Pablo in Mindanao. The West zone concessionaire of the Metropolitan Waterworks and Sewerage System (MWSS) also donated P1.82 million to help construct 1,500 houses for informal settlers in Parañaque. Meanwhile, Manila Water has been funding the Manila Water Foundation which had a budget of P14.82 million in 2012. The East zone concessionaire’s foundation implements livelihood programs, community disaster relief operations and even researches. There is no issue with profitable companies like Manila Water and Maynilad being “charitable” and donating funds for mass housing and disaster relief. I can even forgive them for staging such acts of supposed kindness to boost their corporate image and reap brownie points in the process. But what is unforgiveable is when these pa-pogi campaigns worth hundreds of millions of pesos by the billionaire-owners of the concessionaires are still being charged to us, poor consumers. What is even more revolting is that they even profit financially from their purported acts of altruism. These highly questionable expenses have been included in the calculations of Manila Water and Maynilad’s current basic rate hike proposals of P5.83 per cubic meter (cu. m.) and P8.58, respectively. The various donations made by the MWSS concessionaires do not come from the pockets of Manny Pangilinan, the Consunjis and the Ayalas. They collect it from us through our monthly water bills. We don’t just pay for their income tax; we also pay for their charity work. Also part of their pa-pogi campaigns is advertising and promotion, the costs of which are also passed on to consumers. All in all, Manila Water and Maynilad passed on not less than P279 million of their advertising and promotion expenses and donations from 2008 to 2012. Like the estimated P15.31 billion in passed-on income tax during the same period, the costs of advertising, promotion and donations have been inserted in the basic charge being imposed by Manila Water and Maynilad as recoverable costs under their operational expenses (Opex). While the amount pales in comparison with the huge sum of income taxes passed on to consumers, it is nonetheless as unconscionable and unjust. 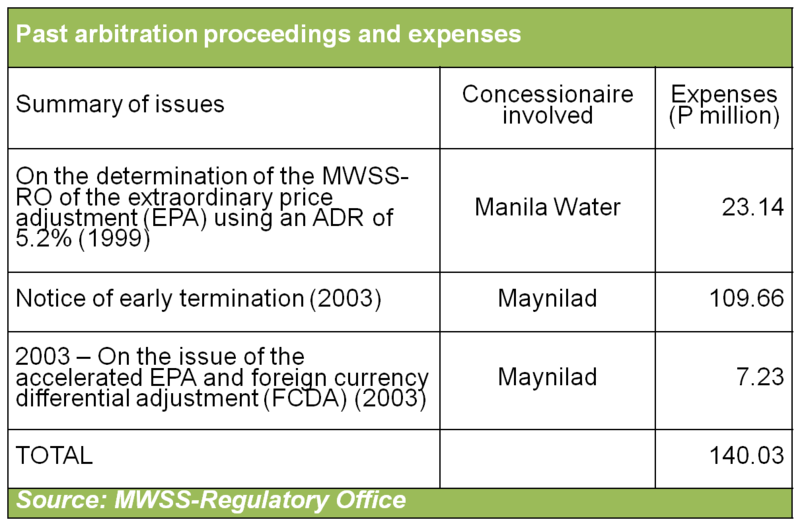 And again, like the income tax, the MWSS concessionaires did not simply pass on these expenses but even gained profits through a guaranteed rate of return on their recoverable expenses. Out of the P279 million, advertising and promotion expenses of Manila Water represent P97 million, and for Maynilad, P140 million, based on documents from the MWSS – Regulatory Office (MWSS-RO). Maynilad also listed P42 million in donations that they included in their Opex while there’s no available data for Manila Water and probably tucked the said item under “Other expenses”. The regulators should conduct a further audit on this; they can begin with the annual budget of the Manila Water Foundation. What exactly are advertising and promotion expenses? Maynilad described the said item, thus: “This pertains to the cost of enhancing and promoting the image of Maynilad, developing harmonious relations with different local government units, establishing rapport with tri-media, advertisement and publication of notices in newspapers and magazines of general circulation, TV/Radio broadcasts, website, public consultations on ground and cost of sponsorships. It also includes athletic, recreational and annual cultural celebrations.” Clearly, such expenses do not have anything to do with the provision of water services and passing the costs to us is blatantly anomalous and unreasonable. The MWSS-RO has already declared that they will disallow the income taxes and donations as Opex items that Manila Water and Maynilad can recover from consumers. This is welcome news. Sadly, under the Concession Agreements entered into by MWSS with the concessionaires, the MWSS-RO has no real power to impose its decisions like real regulators. Manila Water and Maynilad can question the decisions of the MWSS-RO through the process of arbitration. Under Article 12.2 of the Concession Agreement, all disagreements, disputes, controversies or claims that cannot be resolved through consultation and negotiation shall be settled through arbitration proceedings. The arbitration will be presided by a three-member panel composed of one representative each from the MWSS-RO, the concerned concessionaire and a chairman who shall be jointly appointed by the regulators and the concessionaire. 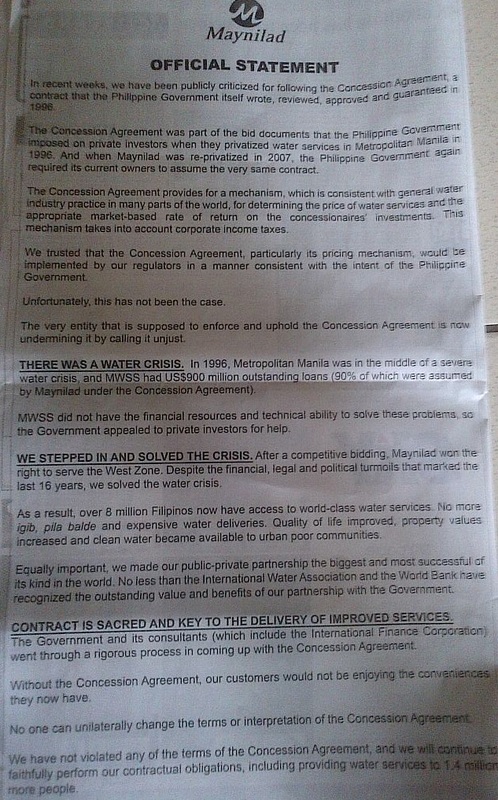 It is important to emphasize that the MWSS-RO is just merely a creation of the Concession Agreement and is in fact being funded by Manila Water and Maynilad. The Concession Agreement’s Article 11.2 mandated the MWSS to allocate a portion of the concession fees paid by the concessionaires to fund the operation of the RO. The Concession Agreement is a form of a public-private partnership (PPP) or privatization contracts that the MWSS entered into with the concessionaires in 1997 and will expire in 2037. 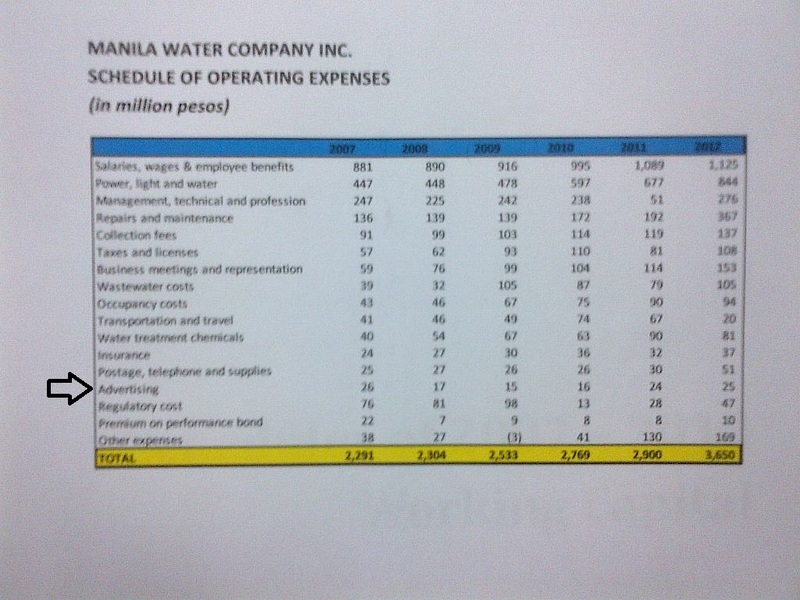 The framework and model of setting water rates that allowed Maynilad and Manila Water to pass on highly questionable charges to consumers including their past and future expenses covering income tax, projects (many of which have never been implemented), as well as advertising, promotion and donations, among others.